Wait, seriously? Seriously??! Why, in the name of all that is good, would you ever have want or need for a veganized version of that crazy concoction? Well celebration, of course! Regional and ritualistic foods are critical to our cultural traditions, our religious ceremonies, and our most important festivals. They are often where we turn first for nostalgic ‘comfort foods’, and unfortunately, they usually contain animals. 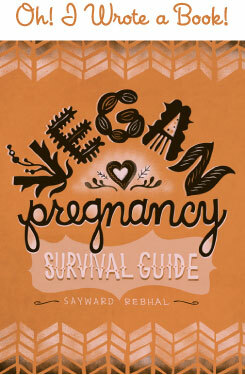 So it’s pretty safe to assume, if ever there’s a peculiar cultural staple, a veganized version exists. After all, the children of immigrants do want to carry on their family’s heritage – albeit in their own modified and modernized way. Haggis has many functions in Scottish culture, including the starring role of the Burns Night celebration. A Burns Supper is held in honor of Scotland’s greatest poet, Robert Burns, most often on the night of his birthday – January 25th. However, a Burns Supper is not restricted to this date, and parties are held at random (blame the Whiskey) throughout the year. So get to celebrating! The supper itself is a long and intricate ritual involving multiple incantations and recitations, an official ‘Entrance of the Haggis’ (accompanied by bagpipes), a formal ‘Addressing of the Haggis’ (an 8-stanza poem that is read to the dish itself), and absolutely ridiculous amounts of whiskey. Here is a more thorough account of a customary Burns Supper. 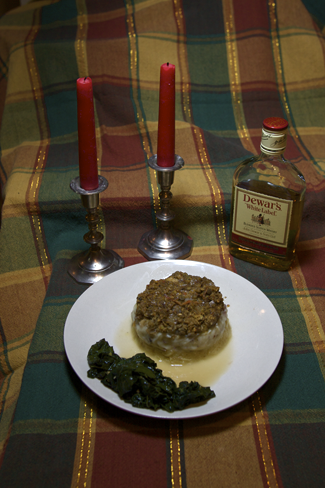 This was my first attempt at a vegan Haggis, which I adapted from this recipe. Haggis is most frequently served with bashed neeps and tatties (that’s mashed turnips and mashed potatoes, served separately) and a generous dram (that’s Scotch whiskey, of course). 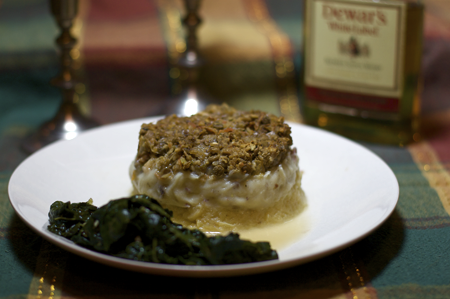 Here, I plated these stacked high, Haggis over tatties over neeps, finished with a sweet creamy whiskey reduction, and skirted with wilted kale. This meal came out wonderfully – better than I remember authentic Haggis tasting – and it makes me look forward to hosting a large and proper Burns Night celebration next year. Well before you are ready to begin cooking, place the oatmeal in a bowl and cover it with boiling water. Let it soak for at least an hour, (it can go much longer if you need). Drain all the water later, when you use the oatmeal. When you are ready to begin cooking, boil 4 cups of water in a saucepan. Add the lentils and continue to boil, 20 minutes or so, stirring occasionally (watch the water level!). While the lentils are boiling, chop all those veggies. When the lentils are soft, rinse them and set aside. Preheat the oven to 375º F. In a large pan, sauté the onion, celery, and carrots in canola oil, until they are soft. Add the spices, the soy sauce, the cooked lentils and about a quarter of the Canellini’s. Stir to mix thoroughly and turn of the heat. Either by machine (food processor or blender) or by hand (potato smasher) purée the rest of the Canellini’s to form a thick paste (you may need to add some liquid). Then, fold this into the lentil and vegetable mixture, along with the soaked oats and the garlic. 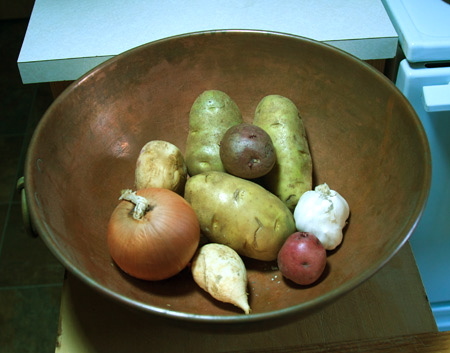 Mix well and add salt and pepper to taste. 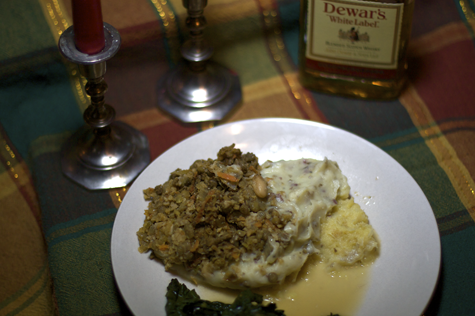 Scoop your Haggis into a casserole dish and bake it, uncovered, for 30 to 40 minutes. 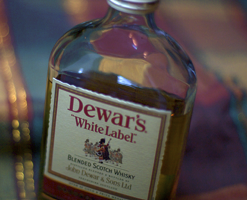 In a small saucepan, get the Scotch to simmering and reduce by about half. Then add the milk and agave, stirring and simmering until it thickens up a bit (it will not get super thick). Add your salt and pepper, and drizzle over Haggis just before serving. Bashed Neeps and Tatties are just mashed potatoes, which I’m sure you know how to prepare (boil and then mash with vegan butter and vegan milk), and mashed turnips (which are made the exact same way). Keep them separate, and serve them side by side or underneath your vegan Haggis. Happy Burns-ing, and don’t forget to cross off #4 on The Vegan’s Hundred! I will be having a bash at that on the 25th, thankyou for the recipe :) Hopefully my omni friends will approve! @ Annie – Ooh, let me know how it turns out! I’m betting this recipe is very omni-friendly. Good luck, and happy Burns Night! How many servings does this yield? Looks great! Is this Iain Allan by any chance? Made this last night for Burns Night with a vegan guest. Wonderful! Thank you. When do I use the steel-cut oatmeal in the recipe? Never mind i found it. I was just reading the recipe too fast.